If that's the man's hat in his right hand.... Explain how he could get it on his head.... It's waaaaay too small to be a hat that would fit his head. I really don't care what you think you see, the same man is wearing the same shirt. Try again. No wonder you're so mixed up, you don't know if you're Arthur or Martha! The whole point is to use images to prove the authenticity of images, that's why you lose. You clearly stated that the Croft Photo displayed the man to be wearing a WHITE Shirt. Just admit Your so called Image Analysis was Wrong. The people situated below this man are wearing White. This guy's shirt in No Way is the same color as their attire. If you suffer from some form of Color Blindness please admit such and this Forum will take this affliction into consideration with any Image Analysis you have previously submitted or might proffer in the future. "Has to be" Proves Nothing other than your frustration. Follow and Rely on the Evidence vs employing supposition and conjecture. 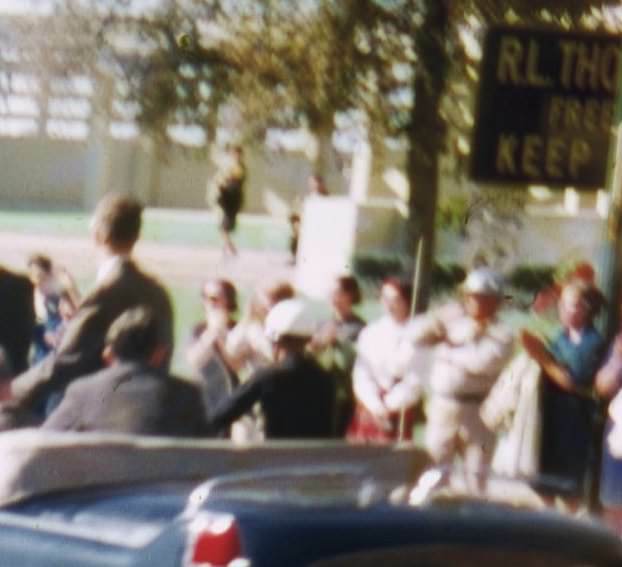 It appears to be the barely visible face of BlueCoatLady Image, next to the taller KarenWestbrook Image's left, in the space between SSSA JackReady Image's right shoulder and SSSA PaulLandis Image's left shoulder, both of whom are on the SS Limo passenger side RunningBoard. Page after page of Storing trying to sell his Altgens 6 was Altered "Urban Myth" Garbage. Enough already, nobody is buying your latest "man in the hat" Urban Myth. It's idiots like you that give JFK Researchers a bad name. The Old Guard and Prospective Wannabees circling the wagons = Nothing New. Until someone can display a Hat being attached/connected to the man in the Croft Photo, there is no getting around there being a Problem with the Conflicting Altgens & Croft Photo Images. Simple Denial will Not resolve what Everyone can see on these 2 photo images. A Hat being clearly atop the head of an individual in 1 photo image vs NO Hat Anywhere with respect to the alleged same individual in the other photo image. No Hat what-so-ever = 2 different individuals.